On the Cover: Ya’ll Know I Love Janelle Monae! So I was out and I picked up the new Black Hair Fashion Beauty Style August/September 2013 Magazine because Janelle Monae is on the cover. Of course she is sitting lovely in her black and white. I really like her. I can’t believe she has a new video out and I didn’t know! I always love the creativity, the flare and the boldness of Janelle. I also dig that she has really attractive female energy in her videos and she isn’t afraid to dance crazy. Furthermore, my favorite video from her remains to be Many Moons. I also adore Tightrope and Q.U.E.E.N. Go Janelle! Gotta include my Many Moons! I really think that the editor is cool and I am glad Black Hair got someone that we could relate to! Her name is Keysha Davis. This issue of Black Hair features fearless women who wouldn’t even give a second thought to other peoples’ opinions of them, Keysha quotes. She says that Monae is one of the most brave, creative, and free-spirited artists of her generation. I really dug the interview! It was cool to know that Janelle wrote and produced Erykah Badu’s part in her song Q.U.E.E.N. I like that she was open and honest. I did not know she was only 24, though. I thought she was in her later 20s. QUESTION: What do you do when you’re not Janelle Monae the artist, and the persona we know you for? JANELLE’S ANSWER: I love laughing, I love art, I love discussion and stimulating conversation where I’m learning things. I like hanging with people who speak different languages. I am just a sponge for knowledge. I swim in my tuxedo, I walk with monkeys, I kiss tigers, I do lots of different things. I have tea with bumblebees. … sounds like something I would say! I also like her dedication to expressing herself and her femininity in a respectful manner as opposed to the get naked get rich fast model. She is all about respecting her Queendom and redefining what it means to be a woman. She say’s that she wants young girls with natural hair to know that they can be Cover Girl’s too. What a lady! That is what it’s about- being comfortable with what God gave you! She is super cool. She ended the interview by saying she uses as many natural products as possible like raw Shea butter from Ghana. That’s what we do, right? Gotta love Janelle Monae! As to the rest of the Aug/Sept issue of Black Hair… it was cool. Black Hair is a nice magazine because it is modern with great photography and many style variations. The images normally look really nice and the women and men are not air brushed to plastic! Definitely realistic photos which oddly is not common in mags today. They have lots of info on weaves and honestly, it is always hard for me to embrace features focusing on weave because I see women hiding behind false hair and using it as definition rather than adornment. Weave can be beneficial in transitioning processes and to use as decoration from time to time. It should not be our everyday mask. We have to learn to let our own hair down! 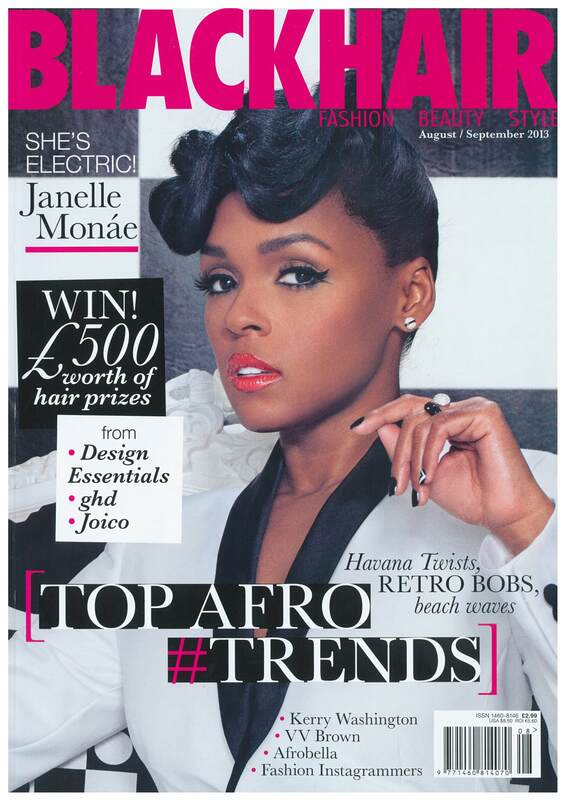 However, this issue had the TOP AFRO TRENDS. There were only a few in the article, but the pages from the issue that I really liked are: Black Hair. This entry was posted in Art, Ethinicity, Culture, Fashion, Identity and tagged black hair mag august sept 2013, BlackHair Fashion Beauty Style August/September 2013 Magazine, how old is janelle monae, janelle monae good or bad, janelle monae many moons, keysha davis editor black hair mag, love janelle monae, many moons review by Shila Iris. Bookmark the permalink.